Resistive switching effects are in a superb position to tackle the challenges for the near future of nanoelectronics and neuromorphics. Material‐wise, the outstanding properties of strongly correlated metallic perovskite oxides, in particular, those displaying metal–insulator transition can be exploited for a new generation of devices based on a volume resistive switching (VRS) phenomenon beyond filamentary and interface ideas. This study reports a full description of this new and robust physical mechanism governing VRS memory effects in mixed‐valence mixed‐conductor metallic La1−xSrxMnO3−y perovskites by identifying the role and rate limiting steps of oxygen exchange through oxygen partial pressure experiments. 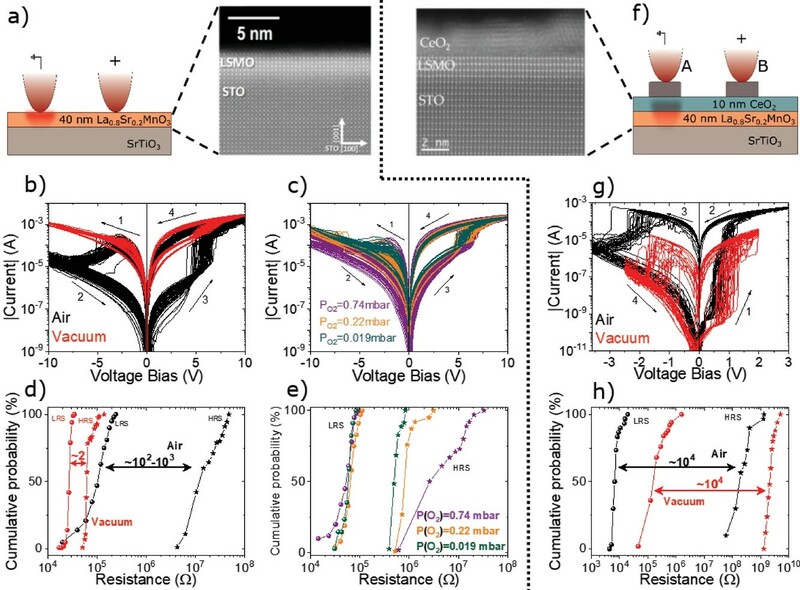 It is demonstrated that oxygen migration can be smartly engineered by introducing a CeO2−x capping layer, which is further used to validate the VRS phenomenon by operating a nonvolatile and volumetric proof‐of‐concept gate‐controlled three‐terminal conductive bridge device.